Just received these soft and lovely blankets. Absolutely like the description and picture. Perfect fit for my guest room and the two twin beds. A great buy and delivered quickly. Have not bought Springmaid before but highly recommend these. They are soft, light weight but warm and just perfect for warmer weather at the foot of the bed - or in cold under a nice quilt or comforter. Thank you Overstock! • The Famous Springmaid Brand Quality: Way back in 1926 Colonel Springs decided to create once and for all, a reliable, high quality brand of home textiles at an affordable price. We stand behind our name with Pride. • Great For a Gift: A blanket makes a great gift for anyone. Why not reinforce your care with a Springmaid Blanket? • Three Blankets in One, Plus Queen and King Sizes: You will love our size selection and here is why: Most blankets come in Twin, Full/Queen and King Sizes, and sometimes a throw size. Our twinXL size is a generous 72 inches by 90 inches, fitting a twin bed, a full bed or for use as an extra large throw. Queen is 90 inches x 90 inches and King is a generous 108 inches by 90 inches. • Versatile Comfort to the Max: You will not believe how soft this blanket it. Not only is this the perfect bed blanket, but is also perfect for the couch, lounge chair or car. For a cozy night's sleep or snuggle up watching the game. • Hypoallergenic: Does not shed, irritate or otherwise cause health issues. Sensitive noses and lungs are safe! • Easy Care: Machine washable in cold water with similar colors. Dries quick on tumble dry low, no ironing or expensive cleaning required! Dimensions 90.0 In. X 108.0 In. It is very soft, and the size is perfect with plenty of overhang on the side of the bed. It appears very well made. It does not feel heavy on you, but is comfortably warm enough. I have ordered 2 of these blankets; the colors are true to the picture and so pretty. I recommend them very much! Love this blanket. Soft, accurate sizing, great color. Adds extra warmth on those cold winter nights. Washes great with no wrinkling. Great price too! Highly recommend. This blanket is a very rich green color and provides a beautiful accent for our bed layering. I chose a larger size for our queen size bed and it fits just as I had hoped it would. Wow, even better & softer than I could imagine! Beautiful twin blankets, love the deep green color, would recommend these blankets for any beds, glad I bought the 2. Very soft blanket, quality great, will be ordering more! Beautiful and soft! Not quite as big as a queen size blanket. But nonetheless, the quality ya beautiful and it feels so soft. If they made a bigger size I may get more. Quality product, color as shown, very soft BUT they sent King instead of Queen. I kept it anyway. 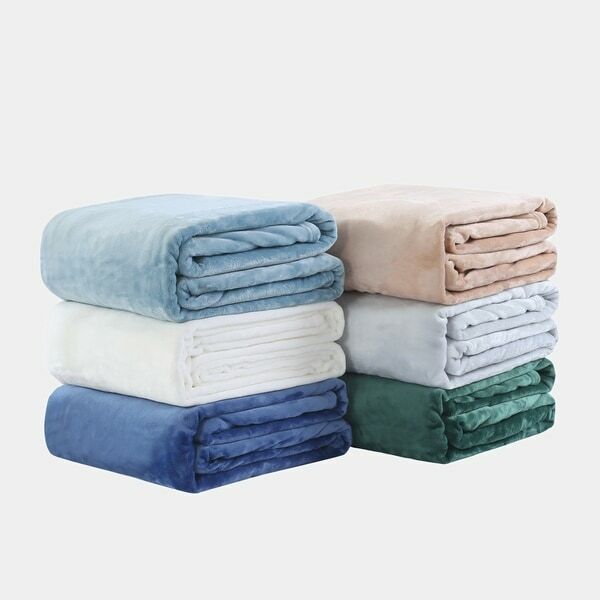 Very luxurious, soft blanket. It looks like velvet. It fits right into my whole glam decor. I wash everything before I use it, and this came out of the washer and dryer very nicely - in fact, even softer than before I washed it! "What dimensions are a queen size blanket"
Queen is 90 inches x 90 inches.